At a cool 16 degrees with 25mph winds, aviation enthusiasts gathered by the Toronto lakeshore to take part in day one of the 61st annual Canadian International Air Show. Approximately 30 minutes after the Air Show started, a weather system came through delivering wind gusts in excess of 47mph. 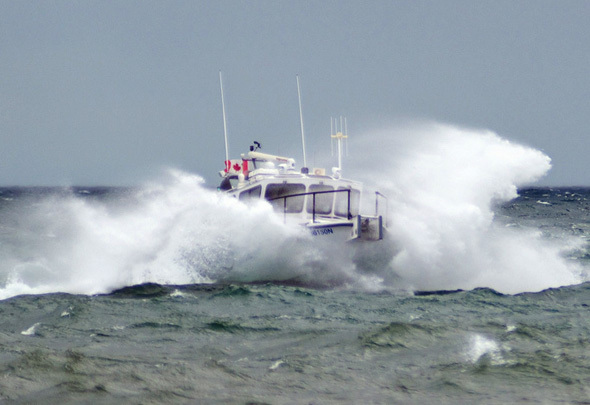 The Toronto Police Marine Unit decided to pull the plug when the swell in Lake Ontario became to great for them to respond to emergencies in a timely manner, should accidents have occurred. Colleen Swider, the manager of public affairs for the show stated "Safety is our number one priority." The high winds would have also made ejecting from the planes almost impossible to execute safely. Fans were able to catch the Canadian Armed Forces Lockheed CP-140 Aurora fly by numerous times while watching Hamilton get pummeled with high winds and rain before the event was shut down. The Air Show resumes Sunday and Monday. Writing and photography by David G. Tran.